Happy Saturday Everyone! 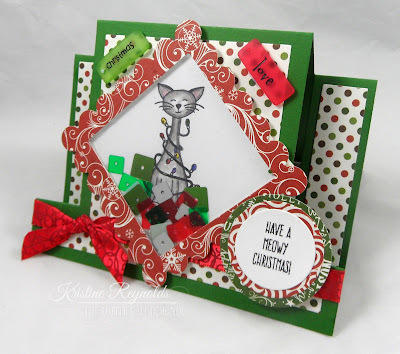 It's Halloween today - but I'm going to share with you a Christmas card from this month's kit cause it's such a terrific kit! 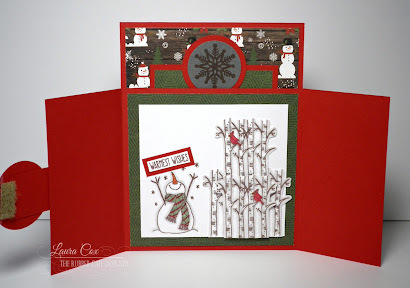 Today I played with layers and border dies. I love the prints in the paper pad from Echo Park that you get in this kit so much that I wanted to use as many as I could in today's card. 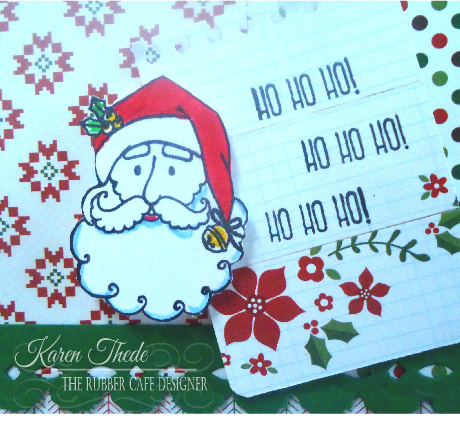 First here's a look at my card that I'm calling Santa's List. 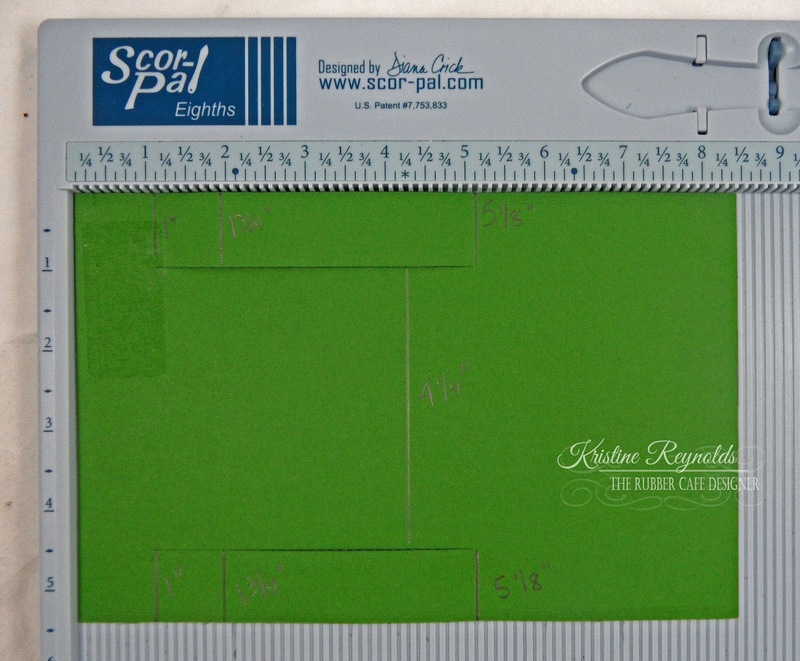 The card base is green A2 card 4 1/4 x 5 1/2 - scored at the 4 1/4". 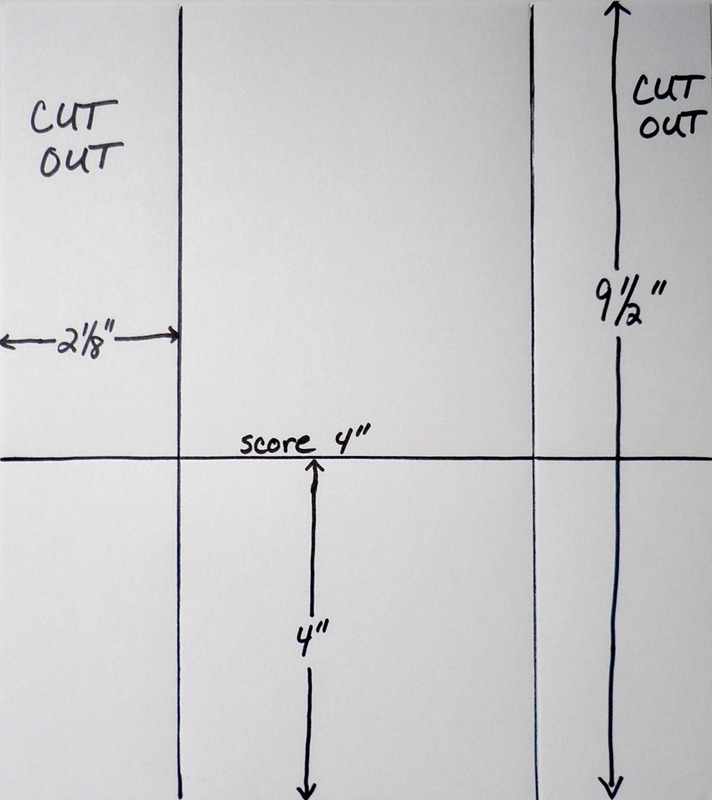 The top two pieces were cut as 2 3/4 x 3 1/2 and 2 x 3 1/2. They were overlapped a bit- to fit into the 4 1/4" width. 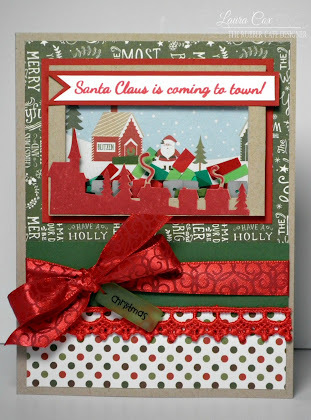 Here's a close-up - I stamped and fussy cut that sweet Santa, and created a pieced list that I die cut the top with a torn notepad edge on. 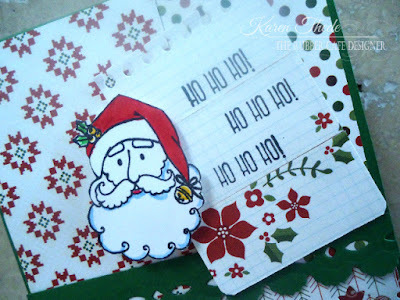 I also stamped the phrase 'Ho, Ho, Ho!, 3 times on this piece. 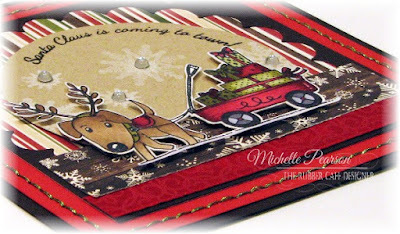 To work on the lower portion of my card I got out my Spellbinders border dies and played around until I found 3 that worked well together. 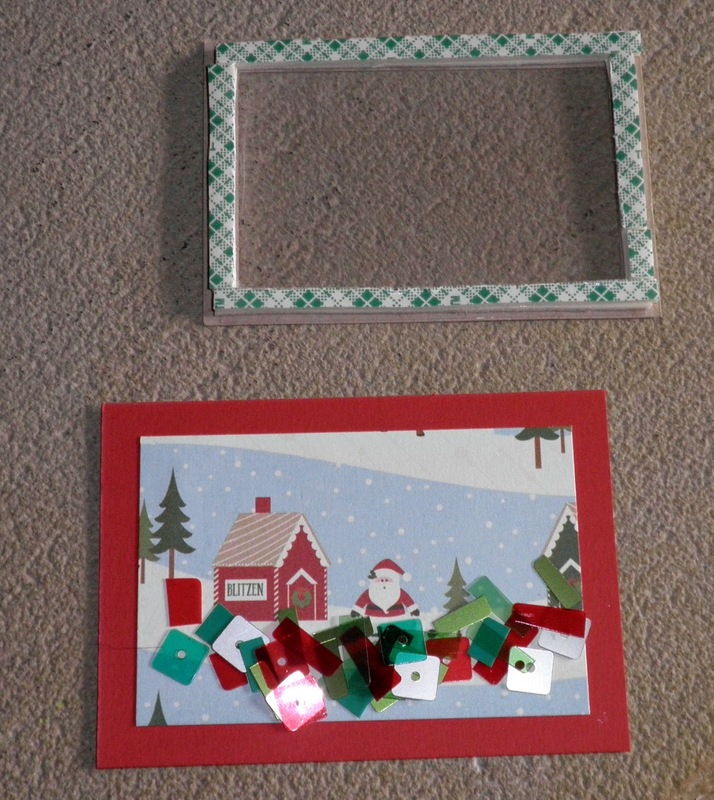 The bottom pieces are all about the same width - 1 1/2" x 4 1/4"
The final green layer is the same color from the card base. I used a smaller scallop die that I laid on an inlet cut piece to make it more airy. 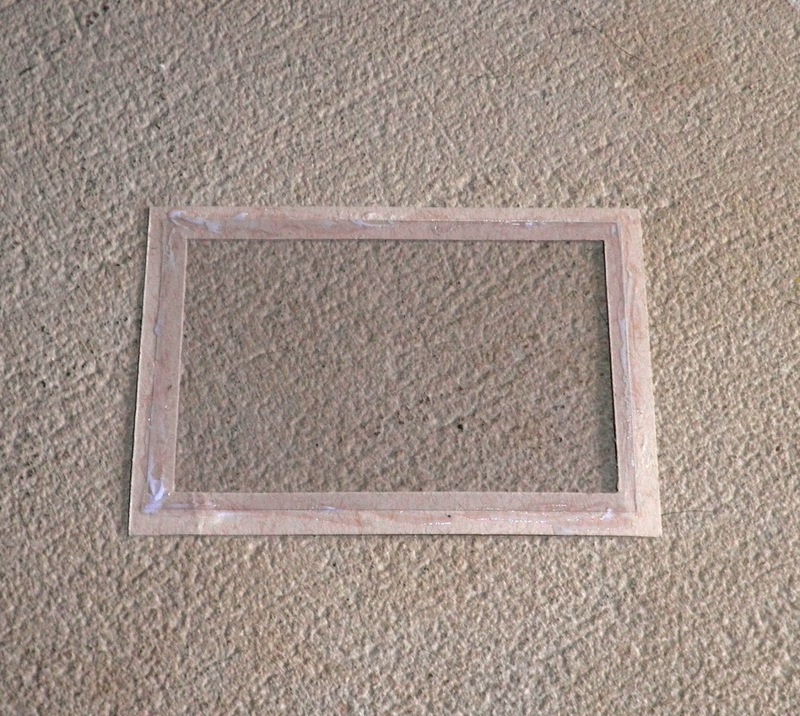 I used this to cover the seam from my Vertical top pieces as they transist into the horizontal borders at the bottom. Well that's all I have for now - I hope you've enjoyed this month's kit - and all the amazing cards and inspirations the Design Team has shared with you - Keep your eyes open there will be a new kit revealed soon! Hi there everyone! 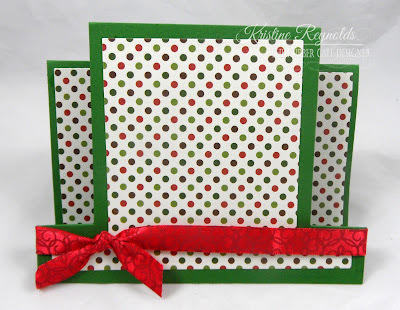 Today I'm sharing an easy fun fold card made with the Home for the Holidays KOTM bonus stamp set that also holds a little holiday gift giving surprise....a gift card holder. Even tho' it looks a little complex, this card is super easy!! 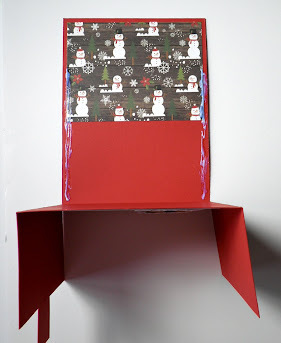 Side panels: 3&3/4" by 1&7/8" snowflake patterned paper. Glue to front panels using Scrap Happy Glue. 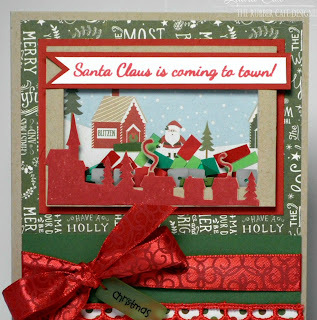 Create the inside panel: Cut a 4" by 3&3/4" piece of green patterned paper and glue to the inside of the card using Scrap Happy Glue. 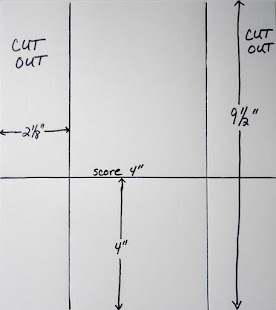 Cut a 3&1/2" by 3&1/4" piece of white cardstock. Stamp snowman using Rich Cocoa Memento Ink in bottom left corner. Color with markers. 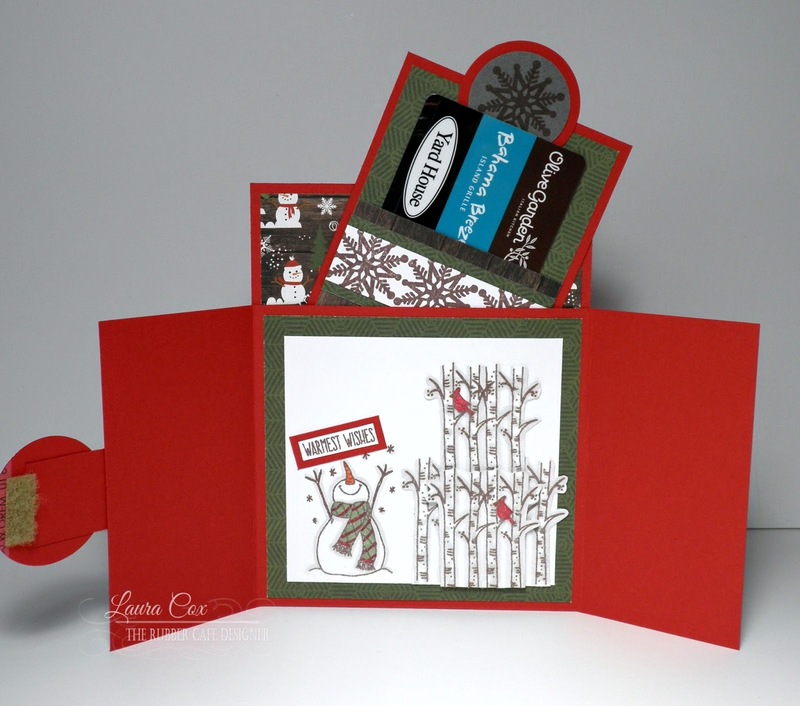 Stamp sentiment using Rich Cocoa Memento Ink on white cardstock, trim down, and mat on red cardstock. Save to glue on later. 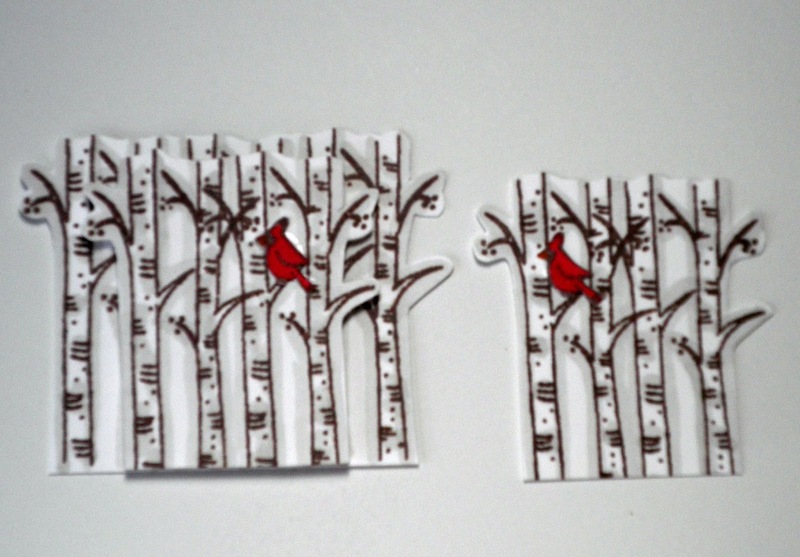 Also stamp trees on white cardstock--two sets of 4 trees, and one set of 6 trees (just stamp them right next to each other). Add shading to the trees using a gray marker and fussy cut out. 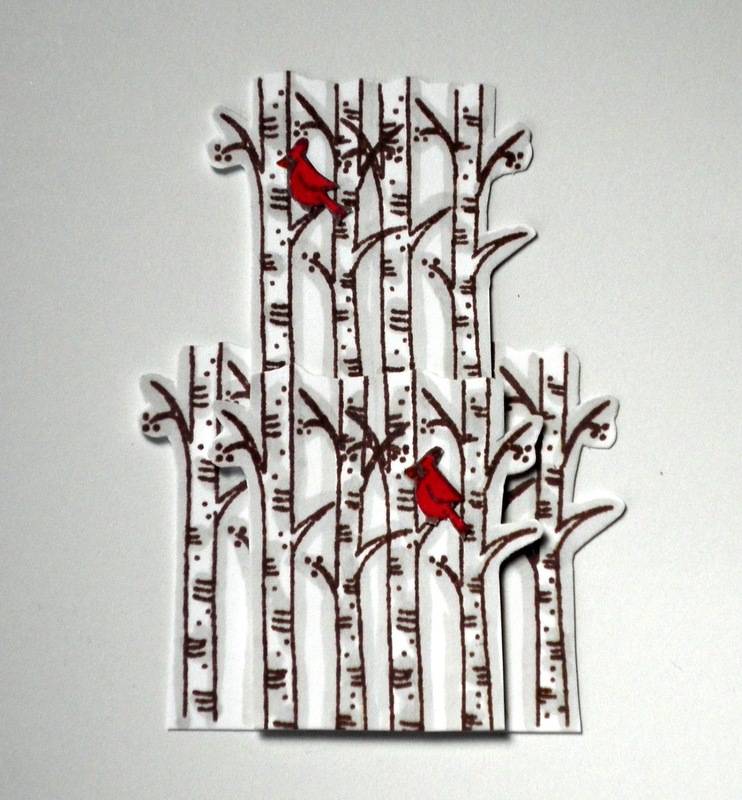 Stamp, color, and fussy cut two cardinals. Glue one each to the sets of 4 trees (one on the left, one on the right). 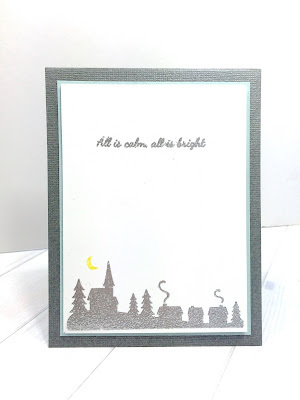 Next, I wanted a sparkling snowy look, so I brushed the tree image and the snowman with Scrap Happy Glue, and sprinkled, then buffed on You're So Fine Crystal Ice glitter. 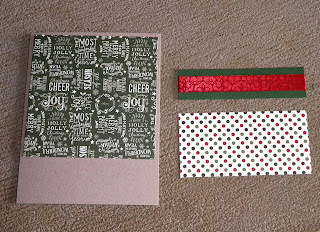 The gift card tag in the pouch, is a 4" by 3" piece of red cardstock, with a 3&3/4" by 2&3/4" piece of green pattern paper glued on top. The pocket that holds the gift card is a 2&3/4" by 2" piece of wood patterned paper glued only around the edges to allow for the gift card. 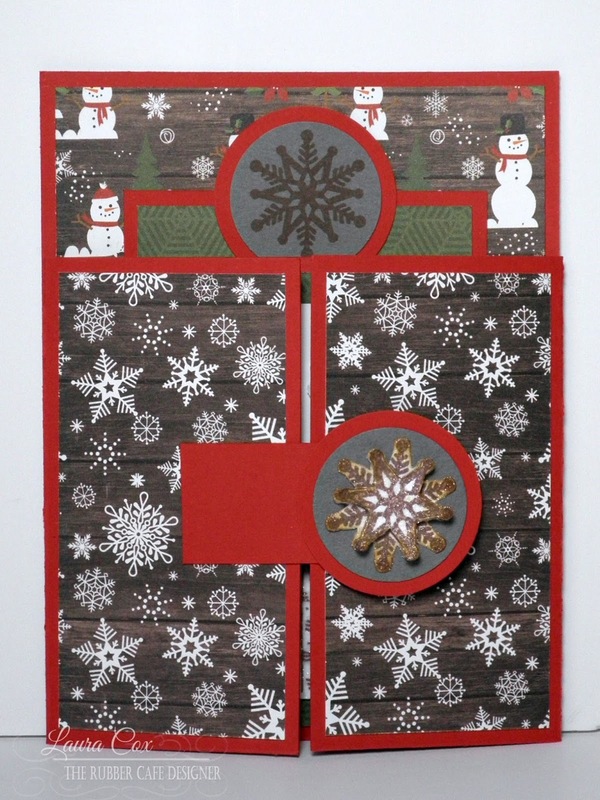 I added a decorative strip by stamping 3 snowflakes in Rich Cocoa Memento Ink on a 2&3/4" by 3/4" strip of white cardstock then matting on a 2&3/4" by 1" strip of green patterned paper and gluing to the front of the pocket. 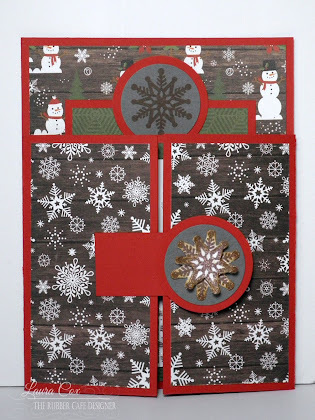 The pull tab is a 1&1/4" circle punched from silver paper (I used the back flat gray side and stamped a snowflake using Rich Cocoa Memento Ink), and mat on a 1&1/2" circle of red cardstock. Glue to the top of the tag. 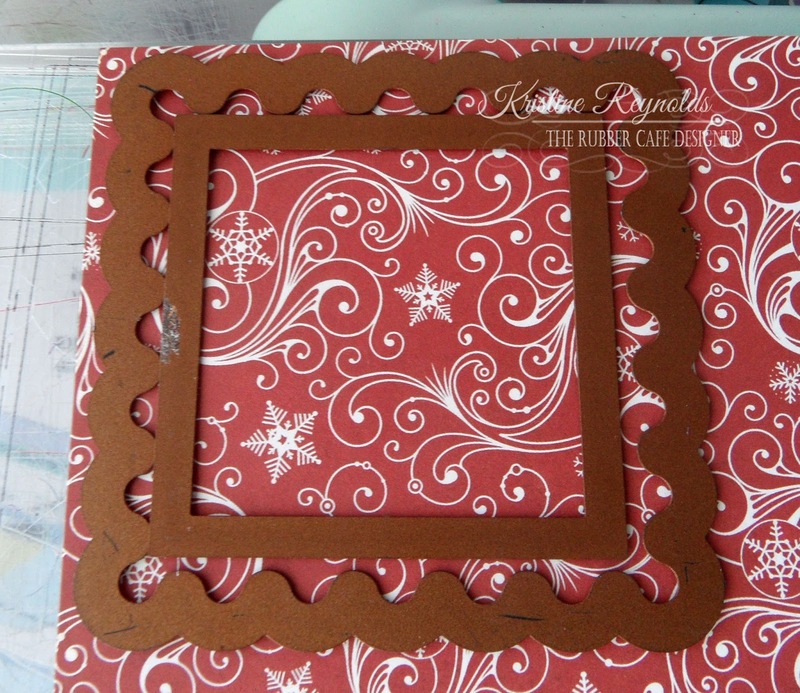 Lastly, to create a "latch" to hold the card closed, just cut a 1" by 2" strip of red cardstock for the tab, punch out a 1&1/4" silver cardstock circle, mat on a 1&1/2" red cardstock circle, and stamp two snowflakes on white cardstock, fussy cut out, then glue to the circle. 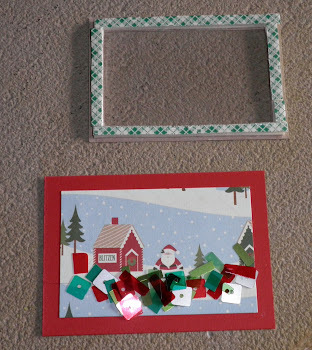 Glue the circle to one end of the tab, and the other end of the tab to the left flap of the card. Add a small piece of velcro under the circle to secure the card closed. Thanks for stoppin' by today! 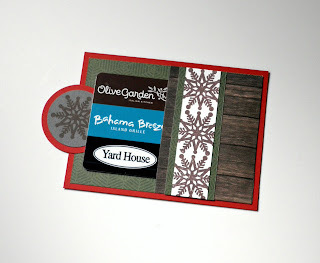 Hope you are inspired to make those gift card gifts a little extra special this holiday season! Ha! Look at this pup....what a fun little image from The Rubber Cafe! 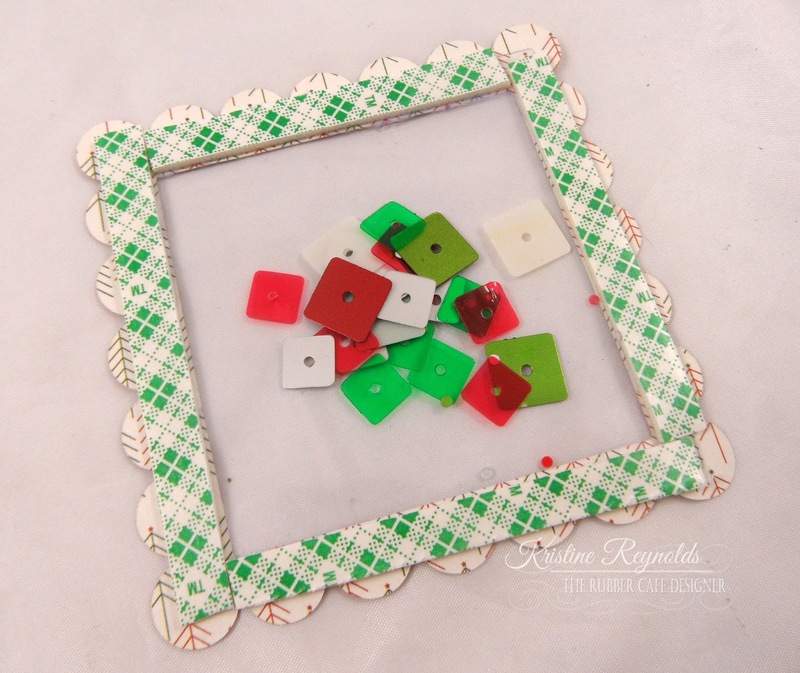 This is another sweet image from the Creative Christmas Creative Cafe Kit. 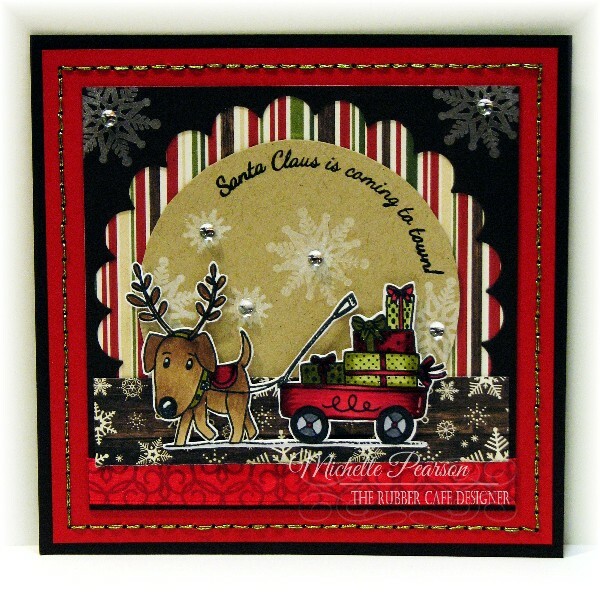 This image is from the Hearts of the Season Add-On set that is available this month. I colored the image with Copic markers and then fussy cut it, leaving a narrow white border. 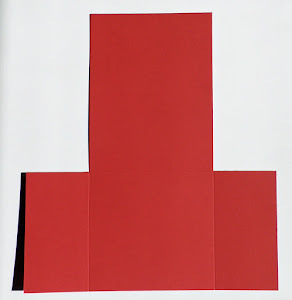 You know I'm nuts about cutting....and the trick is to use a really sharp scissors and turn the paper rather than the scissors. This gives you more control and a smoother cut. 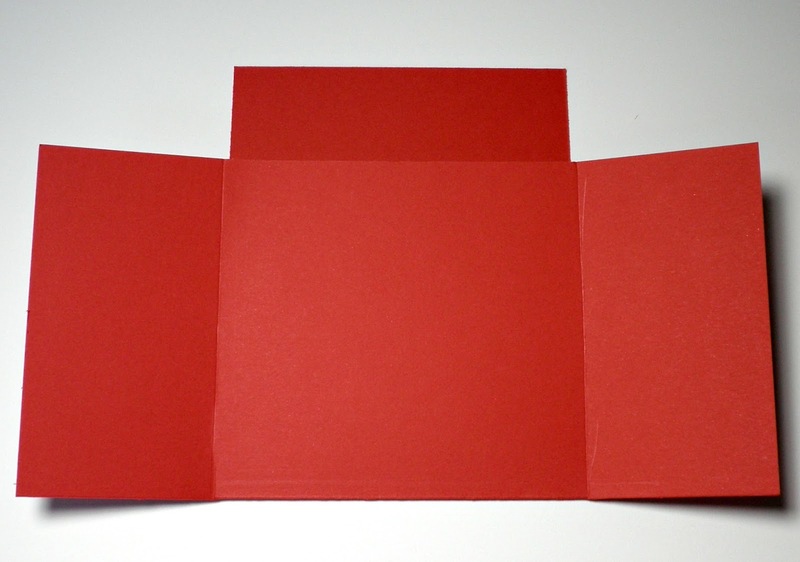 This card measures 5 1/2 x 5 1/2 inches The red panel measures 5 1/4 x 5 1/4 inches. I did a bit of hand embroidery with Metallic DMC Floss (E703) to add a bit of sparkle and fun. I used up scraps from a previous card I did with this kit. 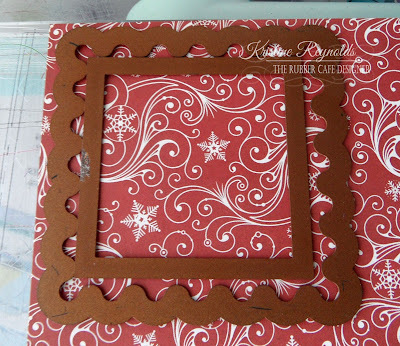 The Spellbinders Scalloped Circle frame I trimmed to a 4 1/2 x 4 1/2 inch square and then lined with a piece of designer paper the same size. 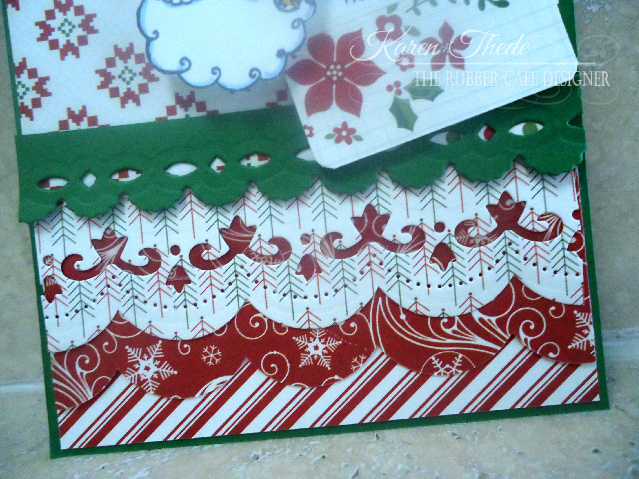 I wrapped a piece of the enclosed ribbon around the base of the scalloped panel and stamped some snowflakes in white ink before attaching it to my prepared card. TIP: Bend your clear stamps for fun effects on cards! 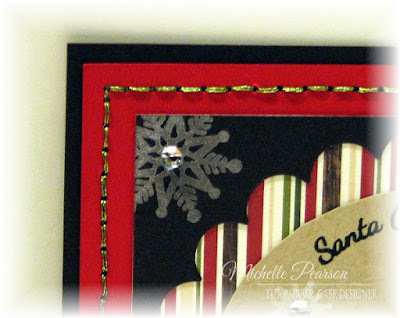 I bent the Santa Clause is Coming sentiment to match the curve of a 3 1/2 inch circle of kraft cardstock that I stamped with white snowflakes. I love the way it ties my card together. I added a strip of the snowflake designer paper measuring 4 1/4 x 1 inch just above the ribbon and then mounted my fussy cut image on it with foam tape. I added a bit of fun bling to my snowflakes with clear Jellie Dots and Glossy Accents. Hello TRC Fans! 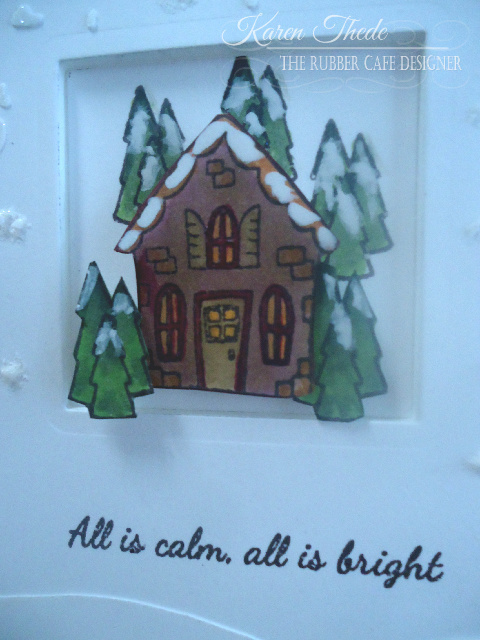 Today I have a fun Christmas card for you. 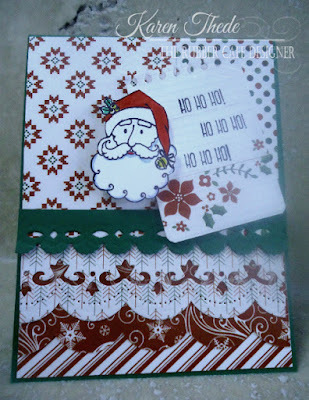 I used the supplies from this month's Creative Cafe' Kit - Creative Christmas. 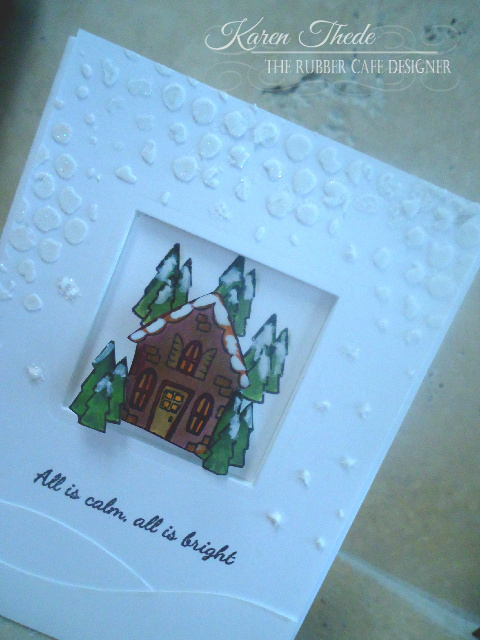 I also used a stamp included in the bonus stamp set - Christmas is Coming. 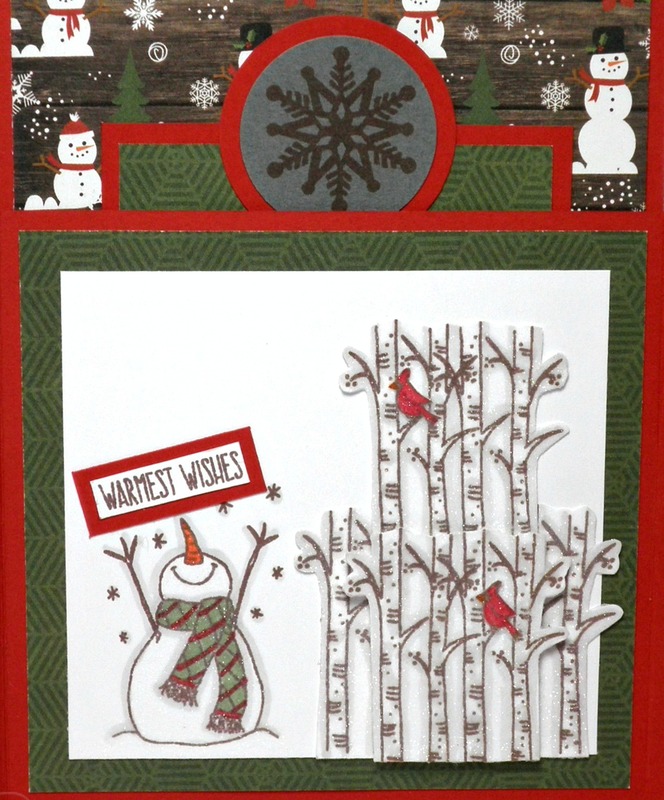 I love Cardinals so this was one of the first cards I created using the kit! I used the different sized circle punches I had in my stash and punched out a bunch of circles using different patterns from the paper pad. I arranged the circles into a tree shape. I stamped the Cardinal image onto white cardstock and colored it with my markers. I cut them out so I could adhere one onto the tree and one along the bottom of the card. 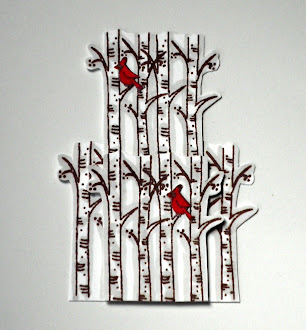 I created the base of the card using red cardstock, cut to 4 1/4 x 11 and scored at 5 1/2". 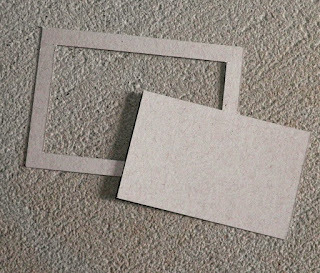 I cut the white cardstock layer to 4 x 5 1/4". 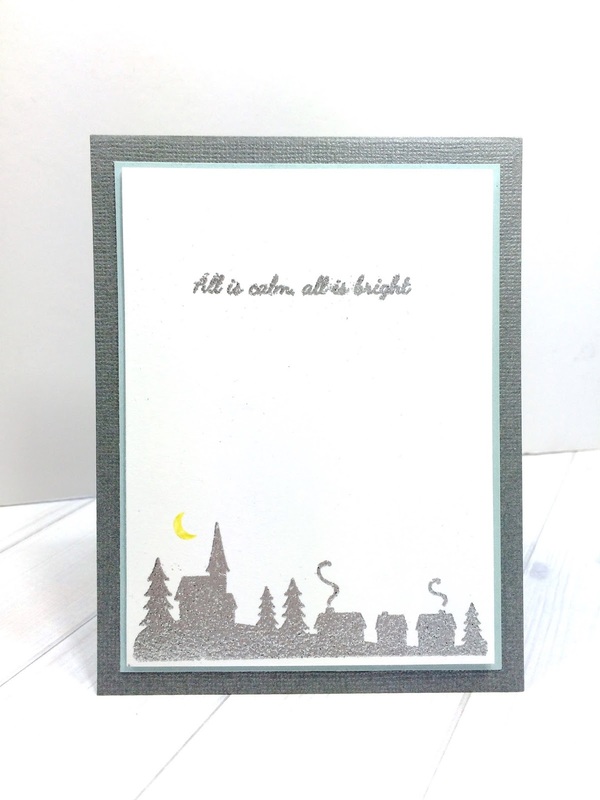 I stamped the sentiment along the bottom using black ink. I added a 1/2" strip of red patterned paper and using some 1/8" Scor-tape, I added the green ribbon (included in kit). This is another card that would be easy to mail! I really love those kind of cards! Thanks for stopping by today. Hello Rubber Cafe' fans! It's Mary Ann here today with a card I made using Creative Christmas, the October Kit of the Month and the cute Merry & Bright stamp from the Christmas is Coming add-on stamp set. 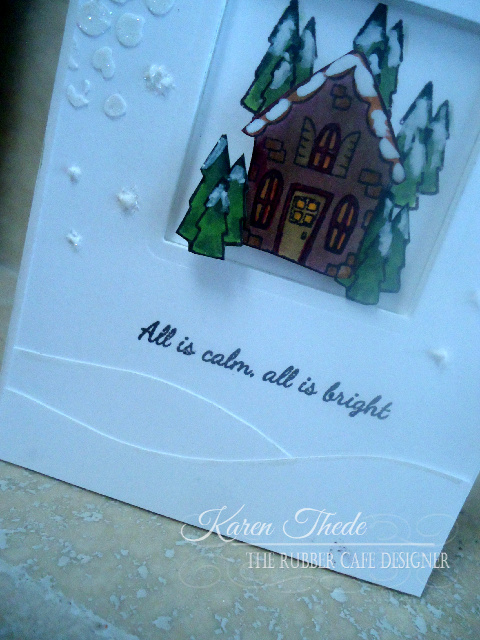 To start my card, I stamped Merry & Bright 5 times onto white cardstock (4x5) alternating the spacing on each line. 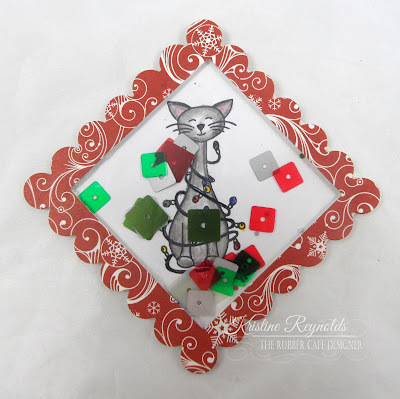 After I had the sequins attached, I added the white cardstock to the next piece of patterned paper (4.5x5.5) and then layered both pieces onto the green cardstock base (10x 6) folded in half. 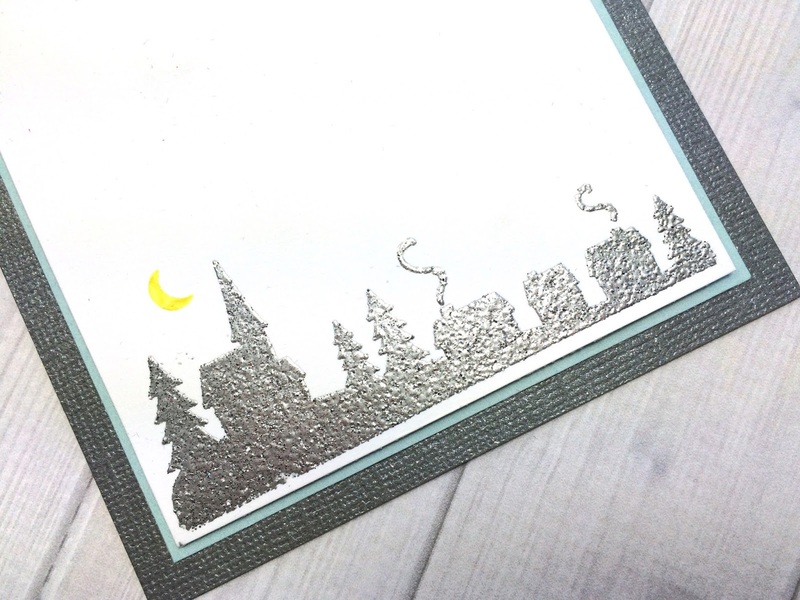 Thanks so much for stopping by The Rubber Cafe blog today, be sure to stop back by tomorrow to see even more creative projects using the October Kit of the Month! Who is ready for the holidays? 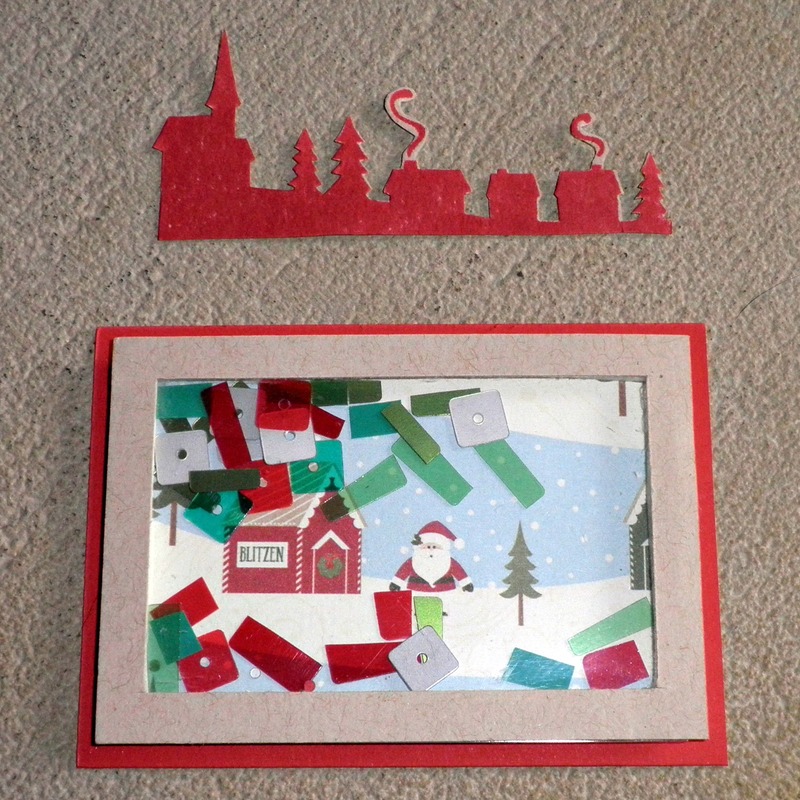 It's coming up fast.....time to make those holiday cards! And we have a load of inspiration for just that all this month here at The Rubber Cafe'! 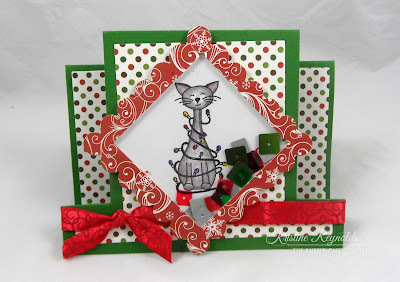 The KOTM is full of gorgeous papers, embellishments and stamps and today, I'm sharing a fun shaker card! First Layer: 4" by 4" square of green festive word patterned paper, 4" by 2" piece of dot patterned paper. 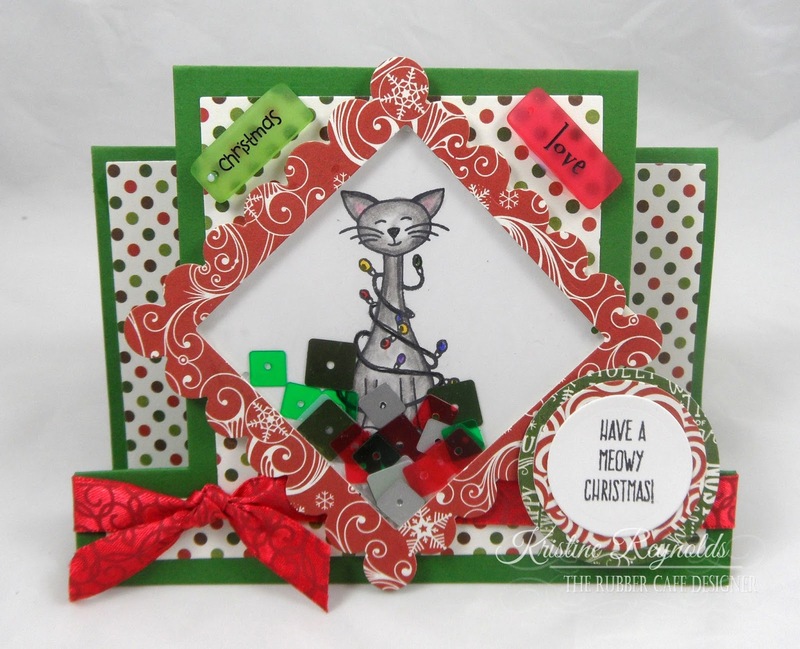 Glue green word to the top of card base using Scrap Happy Glue. Next glue the dot pattern to the bottom of the base. 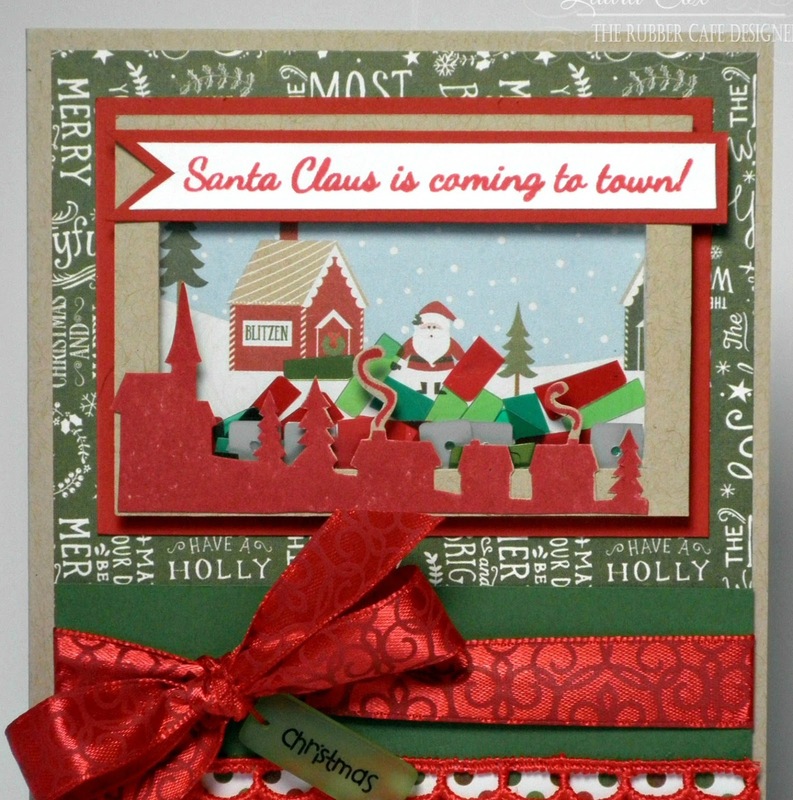 Then add bow to the red ribbon strip and use a bit of thread to tie on the word charm. 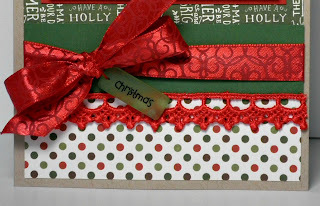 Glue to card about 1&1/4" from bottom of the dot paper, then add red lace trim along bottom edge. 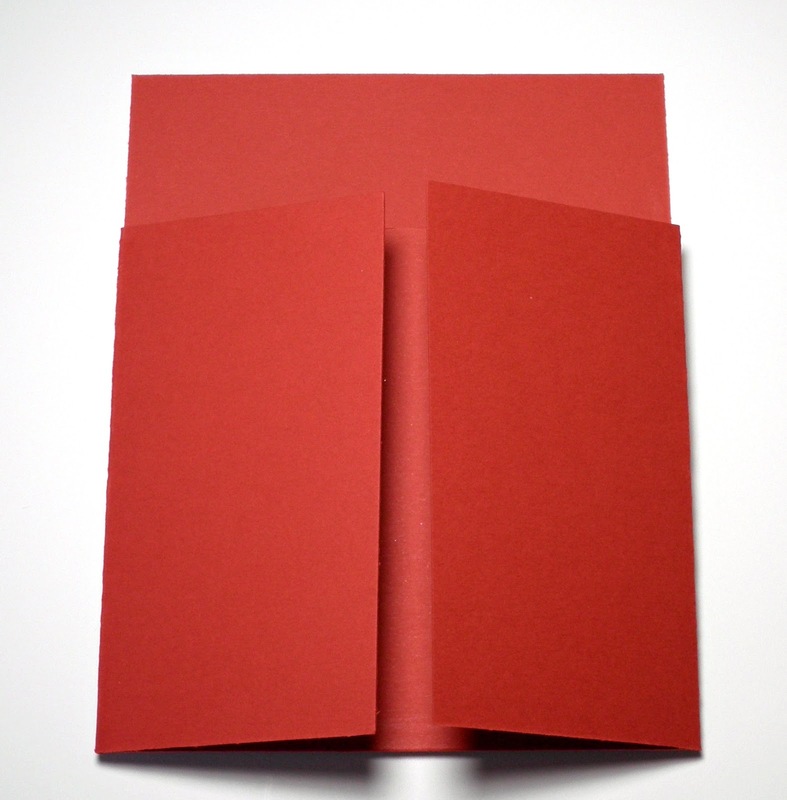 Shaker box: Start with a 3&1/2" by 2&1/2" base of red cardstock. 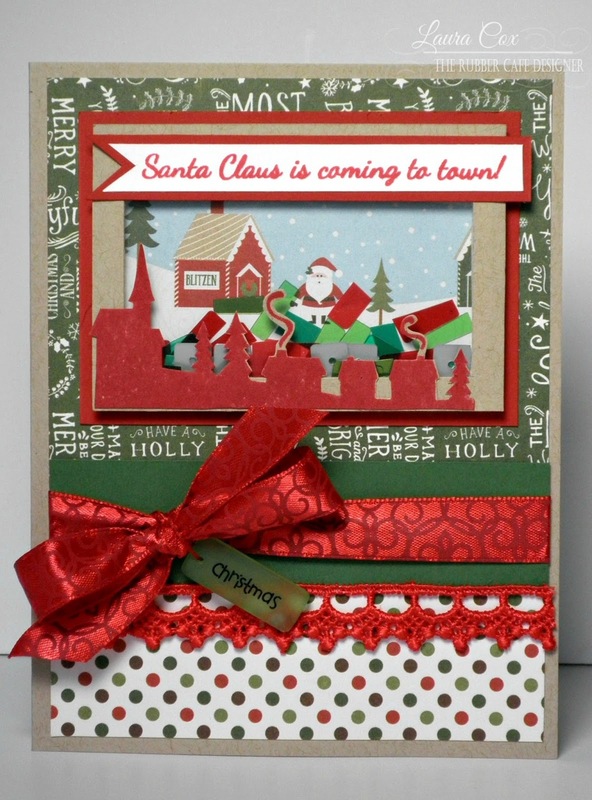 Cut a 3&1/4" by 2&1/4" piece of Santa/Village patterned paper and glue to the red base. 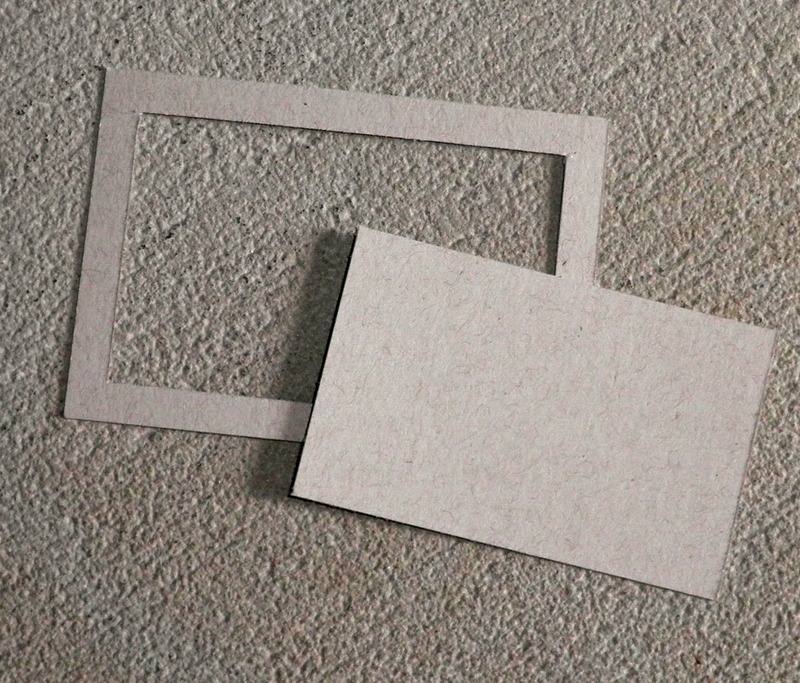 Cut a 3&1/4" by 2&1/4" piece of kraft cardstock, and cut out the center leaving a 1/4" border. 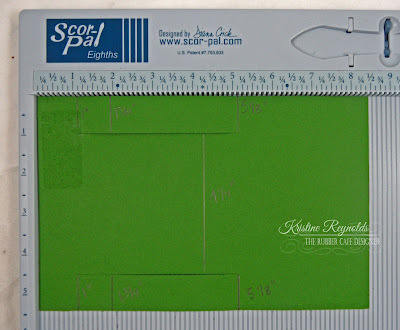 I do this using the measurements on my paper trimmer, you could also use a craft knife. Cut out a 3&1/4" by 2&1/4" piece of acetate and glue to the back of the 1/4" kraft frame using Scrap Happy Glue. 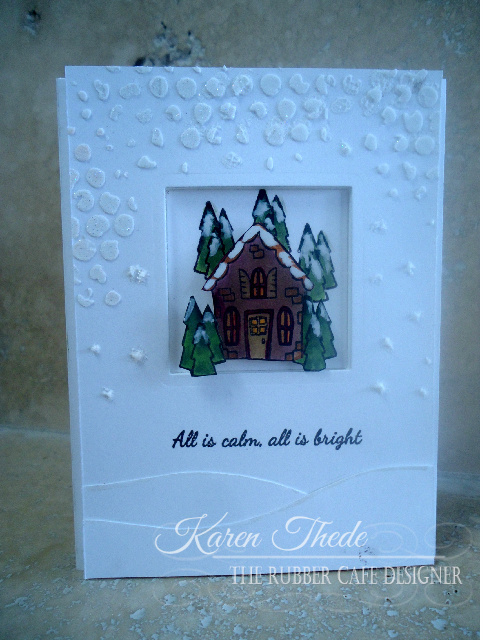 Stamp sentiment on white cardstock and village on kraft cardstock using Festive Berries Distress Ink. TIP: to get a good clean image, coat the stamp with Versamark ink first, stamp off on scrap paper, then coat the stamp with the distress ink. 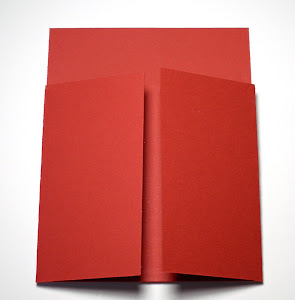 The Versamark helps the ink hold to the stamp for a cleaner image. 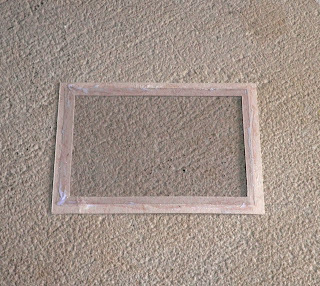 Fussy cut the village and glue to the bottom edge of the shaker box using Scrap Happy Glue. 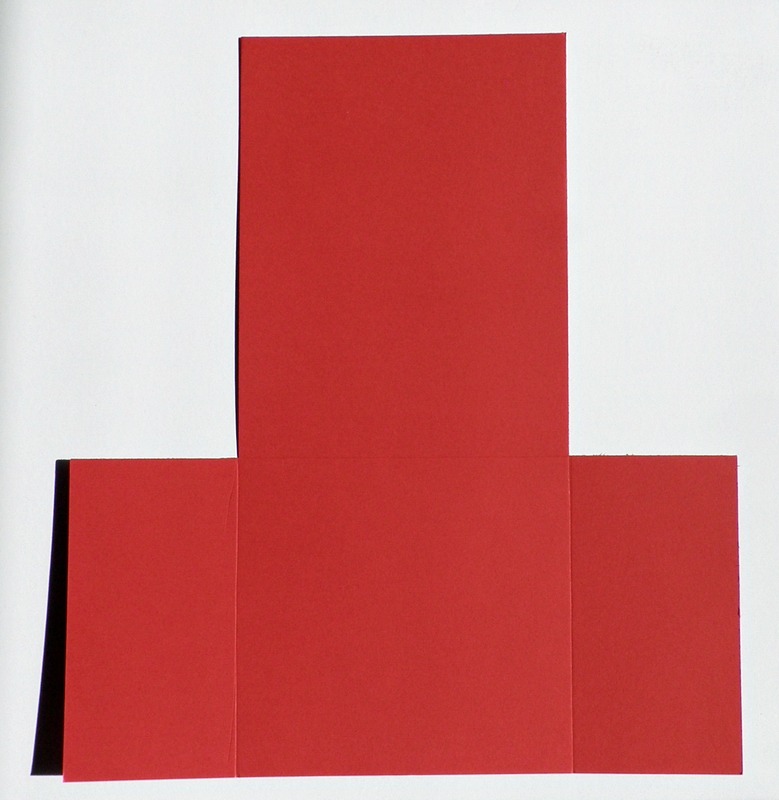 Trim the sentiment into a banner, and mat on red cardstock. 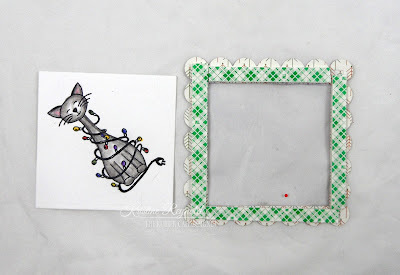 Glue to the top of the shadow box. 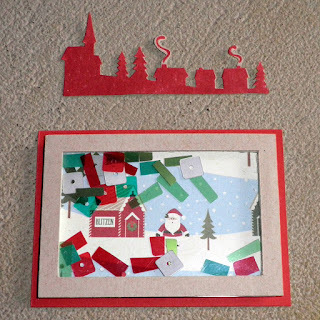 Glue entire shadow box to the top of the card. Thanks for stoppin' by today....stop back soon for more holiday inspiration! !